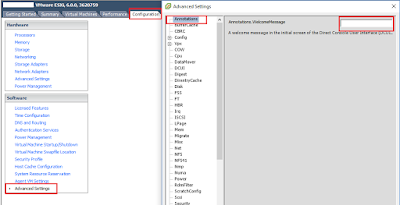 Techies Sphere: How to set Welcome banner/message in vCenter Server? 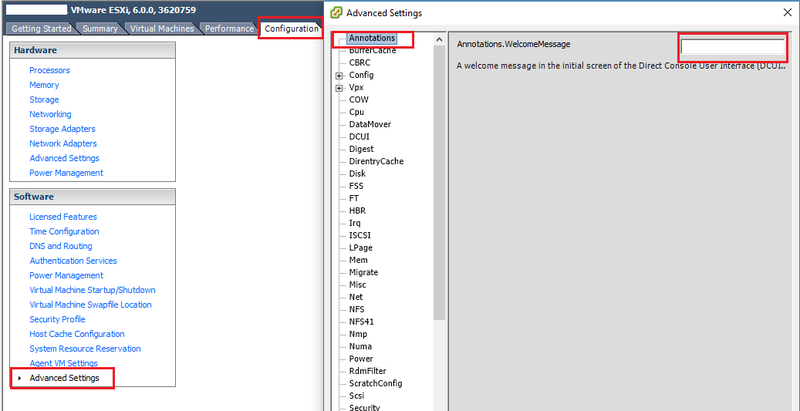 How to set Welcome banner/message in vCenter Server? 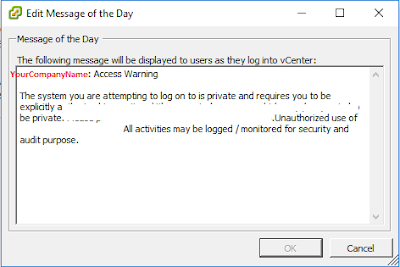 Or, How to set logon message or access warning message in VMware vCenter Server? Or, Access warning logon message in vCenter Server. Descriptions: To meet the security compliance and ISMS standard of your organization, its necessary to configure welcome message or access warning message with some acceptable use case instructions for all devices wherever possible. vCenter Server is in one of them. Please keep in mind, you can configure logon message access warning for ESXi host individually as well.To configure the access warning message you can follow below steps. 1. Login to vSphere Client > Go to any ESXi Host in the cluster > Go to Configurations > Under Software section, go to Advance Settings> The very first section is Annotations, here in the “Annotation-Welcome Message” box. > Write any message you wish and Save the configurations.